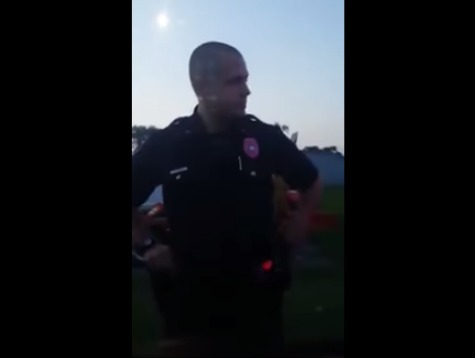 HOUSTON, Texas — A video taken in Sandusky, Ohio shows a police officer threatening to seize a man’s children, and place them in the custody of Child Protective Services (CPS), for failing to show ID during a traffic stop. Christopher Denny, a Sandusky cop, pulled over a car during a routine traffic stop on Wednesday, according to the Sandusky Register. 30-year-old Kathryn Said was driving, and 34-year-old Andre Stockett was sitting in the passenger seat. The couple’s two-week-old baby was reportedly in the back seat. Officer Christopher Denny initially stopped the car because Said’s license plate reportedly showed that she had an expired license. Said handed over her license, which was valid, and Stockett began recording video on his cell phone. Denny proceeded to tell Stowell that it’s a “lawful stop” and that “you match the description” of the individual with warrants. At this point, Denny called for a K-9 unit to search for drugs, claiming that Said appeared “nervous.” After the officer claimed a dog had alerted him to drugs being in the vehicle, Stowell refused to get out of the car. “The narcotic dog didn’t find a hit on this car, you’re full of s**t,” Stowell told Denny. Eventually, the couple got out of the vehicle and were both arrested on obstruction charges, according to the Sandusky Register. Subsequent to the event, however, the officers with the Sandusky Police Department were “counseled” on the bringing up of CPS.